Last week Jason Miles-Campbell, manager of the JISCLegal service, gave a talk entitled “Be Informed: Recent Changes to Copyright Law” at the CILIPS Autumn Gathering. Jason summarised changes to copyright legislation which were approved by Parliament in July 2014 and came into force on 1 October 2014.
the fact that our system of communication, teaching and entertainment does not grind to a standstill is in large part due to the fact that in most cases infringement of copyright has, historically, been ignored. In the field of copyright, two of Sir Hugh’s articles should be laminated and placed on your desk so they may be re-read often. The first is his 1995 Stephen Stewart lecture, “Copyright: Over-strength, Over-regulated, Over-rated”, published in 18 European Intellectual Property Review 253 (1996). 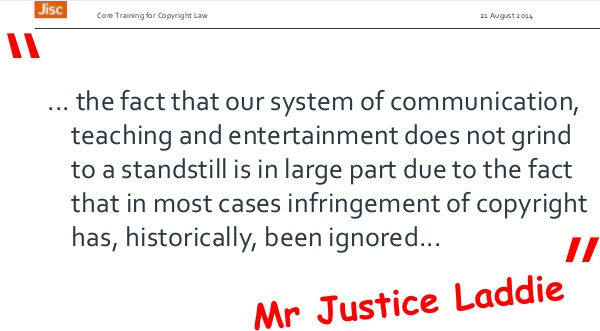 In light of the recent changes to copyright legislation Sir Hugh Laddie’s comment, made that many years ago, that “the fact that our system of communication, teaching and entertainment does not grind to a standstill is in large part due to the fact that in most cases infringement of copyright has, historically, been ignored” could be regarded as demonstrating that flawed legislation will eventually be repealed. However I think this ignores the value of the actions taken not only by those who have pro-actively sought to change the legislation but also the actions taken by those who have ignored legislation which is clearly flawed, in which no or minimal harm is done to others by such action. Several years ago Professor Charles Oppenheim gave a seminar about copyright and institutional repositories at the University of Bath – and terrified the audience when we realised that most of our work in developing an institutional repository would like infringe copyright. 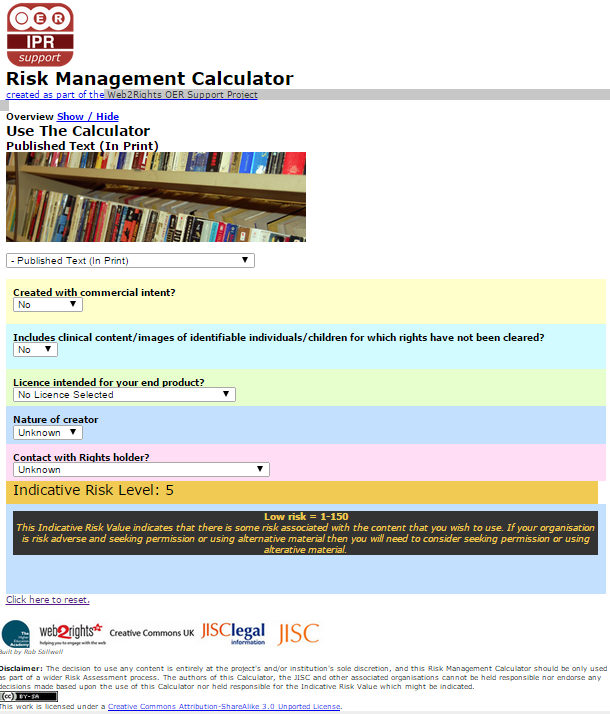 However in response to a question I posed as to whether copyright concerns would inhibit the development of the repository, Charles said this needn’t be the case: rather there is a need to understand the legal issues but to make an informed decision on actions based on an assessment of the risks and a decision as to whether the organisation was prepared to take the risks. Charles and I subsequently co-authored a paper on “Empowering Users and Institutions: A Risks and Opportunities Framework for Exploiting the Social Web” in which we documented a framework for making an informed decision in addressing copyright and other issues. What Else Have We Subverted? Beyond copyright there are other examples of supposed legal requirements which can be seen to be flawed, so that ignoring them can be done for those who are willing to take a small amount of risk. The information transmitted is the property of the University of xxxx and is intended only for the person or entity to which it is addressed and may contain confidential and/or privileged material. Statements and opinions expressed in this e-mail may not represent those of the company. Any review, retransmission, dissemination and other use of, or taking of any action in reliance upon, this information by persons or entities other than the intended recipient is prohibited. If you received this in error, please contact the sender immediately and delete the material from any computer. Although I am entitled to forward the message it would appear that subsequent forwarding to other who may have to process the request for information is prohibited. But does anyone care about such legal niceties? Beyond the infringements which many computer users may be guilty of in the early days of the Web creators of HTML pages will have created pages containing links to other Web sites almost certainly without getting permission to create such links. But even back in 2008 there were still discussions as to whether you need permission to link to someone’s content. Just over year ago I asked “Do We Want Radical Law-Breaking Librarians?” The background to the post was a BBC News article which described how “UK’s top prosecutor defends journalists who break law in public interest“. The story was about the role of journalists in making information publicly available. Keir Starmer, the director of public prosecutions insisted that it “would be very unhealthy if you had a situation where a journalist felt that they needed to go to their lawyer before they pursued any lead or asked any question“. The article went on to suggest that library rules which seek to ban use of mobile phones which can be used to make copies of copyrighted resources or take photos of people without their permissions may be counter-productive. I would argue that the welcome changes in copyright legislation have come about not just from the advocacy of organisations such as Jisc and CILIP but also by the risks-takers. Blessed are the risk-takers for they set the path for others to follow! On 21 October 2014 the CJEU had to decide in the case of Bestwater whether embedding content in a website via “framing” constitutes “communication to the public” within the meaning of Article 3 of the InfoSoc Directive  and therefore infringes the copyright of the creator of the content. The CJEU has now made it clear that linking does not constitute a “making available to the public” (or any other form of communication to the public), irrespective of which linking technique is used as long as the link leads to a website that is available to the public as a whole. where it had already decided that hyperlinks do not constitute a “making available to the public” provided the link is to content that is freely and lawfully available online. Or, in brief, you can link to Web resources and embed Web content in frames provided that the content itself is freely and lawfully available online. You can now, it would seem, create links from your Web pages to such resources without having to worry too much about the legal ramifications. Of course, you may have been doing this already, before the legal ruling was made! This entry was posted on 4 Nov 2014 at 11:35 am	and is filed under Legal. Tagged: cilipsag14. You can follow any responses to this entry through the RSS 2.0 feed. You can leave a response, or trackback from your own site.